NORTH, SOUTH, WEST, EAST, FRANCE, Route ideas and places to go. There is a trip planned to Lambay Island, which contains a 126m Binnion being organised by member Mark Brennan. It was to have been in October but has been postponed due to bad weather. 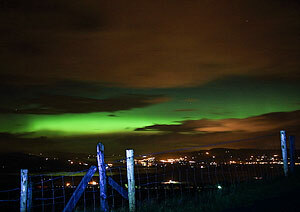 Northern Lights as captured by Aidy from Greenan Mountain in Donegal. The green behind the clouds is the Northern Light, Aurora Borealis. The greenness is from the solar wind exciting oxygen in the outer atmosphere. 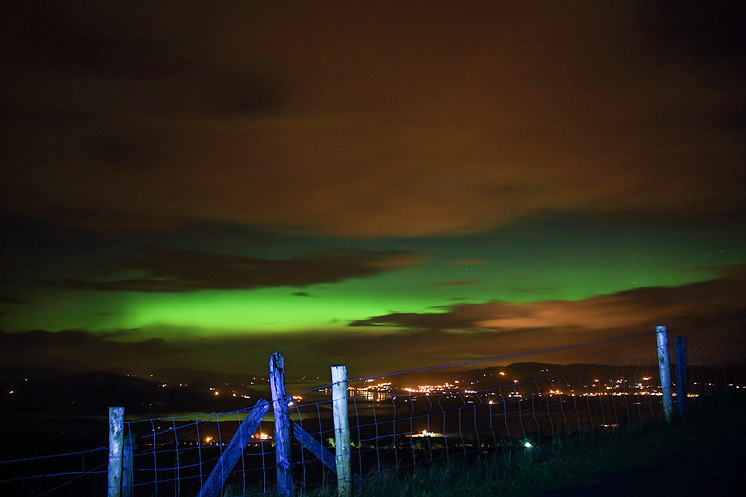 The colour of the underside of the clouds is probably more to do with street lights in Buncrana than anything celestial and as for the spooky blue of the fence - a torch! 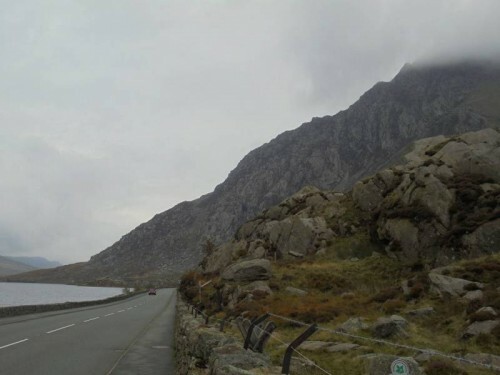 This month's featured track is one of a couple Onzy has submitted following a flying trip to the dramatic mountains of Snowdonia, easily reached from the Holyhead ferry terminal. His itinerary is one of the very best outings possible in England and Wales, ascending the comically prickly petrified Stegosaurus that is Tryfan via the classic scramble up its north ridge, continuing over the other-worldly stonescape of Glyders Fach and Fawr, before descending though a lot more stones past the awesome mouth of the Devil's Kitchen. For anyone who thinks Ireland is lacking in (what might be termed) Grade 1 scrambling, a trip to Snowdonia might be the answer. Note: As you may know, we recently started improving our shared track display. This is not finished by a long shot, however below shows how you can incorporate photos into a shared track. Route up Tryfan North Ridge and over the Glyders, descending through the Devils Kitchen. Having decamped for a couple of days to Wales, 7am on day one found me parked in a layby on the A5 immediately north of Tryfan. It was 7.30 before it was light enough for me to feel comfortable heading upwards. The walk started well with some steps (! ), a sign from the Welsh Equivalent of Mountain Metheail, and a box soliciting donations towards the cost of the path works. Clearly not many contribute, because the steps/path don't continue far. There are scuffed paths of sorts all over the hill, but nothing official and no clear, or sole, way up. The north ridge of Tryfan is rated as a grade one scramble, which sounds straighforward ... however, it is not like any scramble I have ever attempted This is a wall of tumbled and shattered rock, interspersed with gullies and scree channels. It is more than occasional 'hands on rock', at times being full on climbing - I cannot remember ever having so much to physically haul myself upwards using my upper body - an entire body workout and very hard going. Also, there were many dead ends where no way forward was possible and many consequent backtracks It's a matter of one hand after another, one foot after another until the top (mercifully) is reached. The road is at 300m, so the initial climb is only 600m, but it took a hard two hours; 2 hours after which I had covered less than 1km from the car! 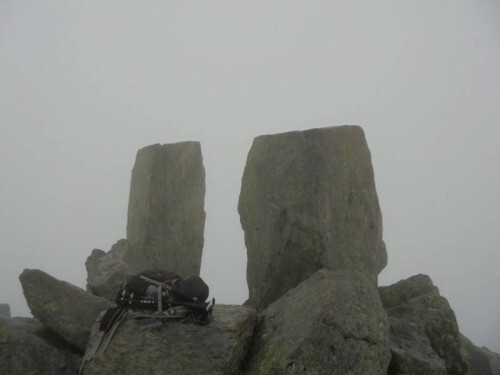 This is a rocky place; the summit of Tryfan, Glyder Fach, and much between involves clambering over shattered rock. It is very hard to get into any walking rhythm here; four hours after leaving the car, I had covered 4km. 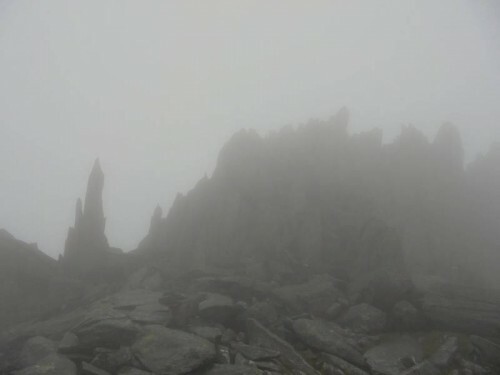 Only when past the eerie Castell Y Gwynt - like the tor on Slieve Bearnagh except sharper! - does the path begin to become unambiguous. 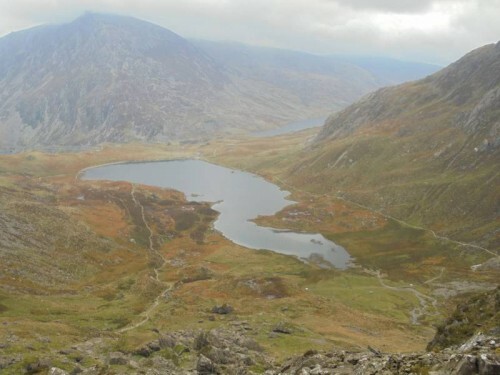 Over Glyder Fawr and the path down through the Devil's Kitchen is clear - not unlike our own Devil's Ladder on the upper reaches - but less steep and with well made paths lower down. Overall a great walk but definitely not a day for photos! Confidence in the reception given to walkers in the Benbulbin area is further increased by Onzy's circuit based on Benbulbin itself and the extraordinary (formerly forbidden) outpost of Benwisken, seeing as his pairing survived an encounter with a turf-cutting party totally unscathed. It's a route where very steep ascents and descents bookend wanderings along the edge of a brutally defined plateau with many startling downward views. Summiteers could easily add Kings Mountain while they're up there. NORTH: A pleasant walk, even with a twisted ankle! Aidy explores Crocknamoghil Hill in the Sperrins and enjoys a virtual stroll through the gentle scenery despite an ankle injury. The south side of Glencar in Sligo seems to cheerily ape the north side, with steep grass slopes culminating in bright white outcropping limestone. Driving round to the next valley down (as it were) gets you away from the amenities and the ice cream vans (alas) and gives several quietly rewarding walks on very distinctive hills. 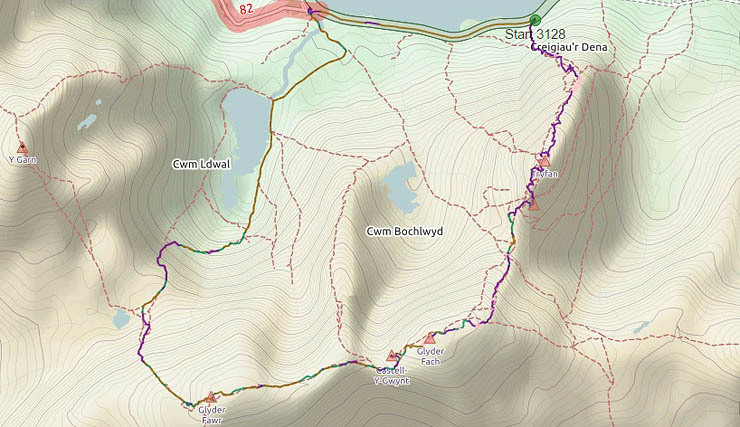 simon3 has uploaded a track exploring those hills peering over into Glencar, with easy walking once past the initial sharp ascent, and some very fine views into the interior and (particularly) the coast. This is a half-day itinerary...those wanting more could link to the five tightly-knit tops of the Keelogyboy group. NORTH: Small top, huge views. The Binnion, Cashelmore earns two comments, from Simon 3 and David-Guenot, both reflecting its relative easiness and the wonderful 360 degree panoramic views. group on Cashelmore, (An Caiseal Mór): Huge views from a rough heathery top with ringfort. Knockavoe in the Sperrins is just a short stroll across some fields, reports Aidy, and offers expansive views in all directions. The good ship CaptainVertigo has docked once more in the harbour of MV with another lavishly illustrated and informationally garlanded excursion, this time from the Derryveagh region of Donegal. His wonderfully annotated photos remind this reader of the way guidebooks used to be done in the mid-1980s, which is no bad thing, while his wry and self-depracatory text somehow does a lot more than just describing a hillwalk. His target was the very rough area around and on top of Slieve Snaght, this time approached from the south. Those based in the north and starting up the Poisoned Glen can add at least three lower summits to the north-east. Either way, amongst Ireland's best. conormcbandon has donned his wellies and sallied forth into some of the boggiest terrain that South Connemara has to offer, returning with ascents of two relatively lowly but apparently very worthwhile tops. Shanavara, the higher of the pair, may well be more easily reached from the north, but this track visiting both it and Knocknadav comes in from the south, and is rewarded by very intimate views of mountain, water and waterlogged mountain. The joy of this lesser top does not come from the rather nondescript summit area which is rather flat and boggy. 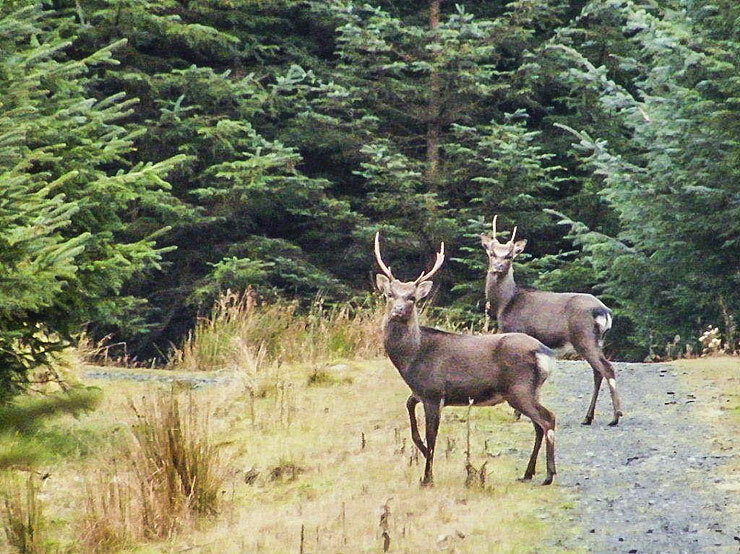 It comes with spotting up to a dozen Sika Deer who happened to linger long enough to get a snap with the camera. There were also Red Grouse, Raven, Snipe and a small flock of Crossbills feeding on pine cones. It makes hill bagging all worthwhile! By the way - I make Annalecka Bridge at O05560 01852. All other directions fine. SOUTH: A view of mountains, coums, waterfall and sea. 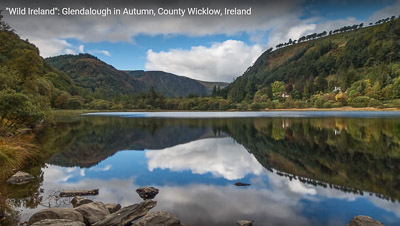 The oddly named Knockaunapeebra in the Comeraghs is a towering 724 metres and offers one of Ireland’s best viewpoints, reports jackill. 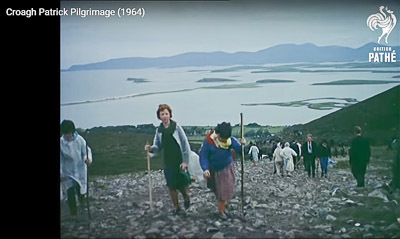 group on Knockaunapeebra, (Cnocán an Phíopaire): A view of mountains, coums, waterfall and sea. An updated short summary for Mothaillín in the Dunkerrons. group on Mothaillín: Untracked hard ascents for superb views. SOUTH: Unrelentingly steep, fine aesthetic, dull summit. 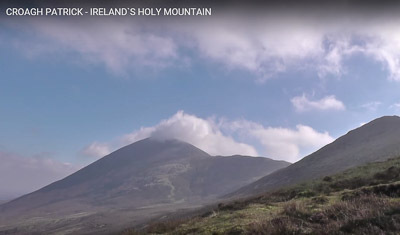 Broaghnabinnia is a fine looking mountain but is tough as they come, no matter which way you approach, reports Colin Murphy. Colin Murphy on Broaghnabinnia, (Bruach na Binne): Great looking, summit disappoints. Back in 1990, MV Member SpiritOf84 promised himself to one day ascend Brandon, and finally fulfilled the ambition on a fine Kerry day. EAST: New member’s first climb. Seefin in the Dublin Mountains proved to be a satisfying first ever bag for new MV member wild_brian. The less famous Brandon is to be found towering over the village of Graiguenamanagh and is a worthy ascent with superb views, reports Kennyj. David-Guenot has submitted several very interesting tracks from the Pyrenees during October, both of which are at a palatable level of strenuousness for the average able-bodied hillwalker. The more spectacular of the two is the ascent of the Pic de Garlitz, a walk whose ridges gradually increase in airyness until a final sensational arete leads to the top: enough to put hairs on your chest from the look of his excellent photographs. David-Guenot on PIC DE GARLITZ: A TOUGH FINISH !! If you fancy a challenging, comic, absurd film you might like to try The Lobster, directed by Yorgos Lanthimos. According to one review "In a dystopian near future, single people are obliged to find a matching mate in 45 days or are transformed into animals and released into the woods." Readers of this website who go might also enjoy the extra jarring caused by most of the setting: the natural Iveragh Peninsula. 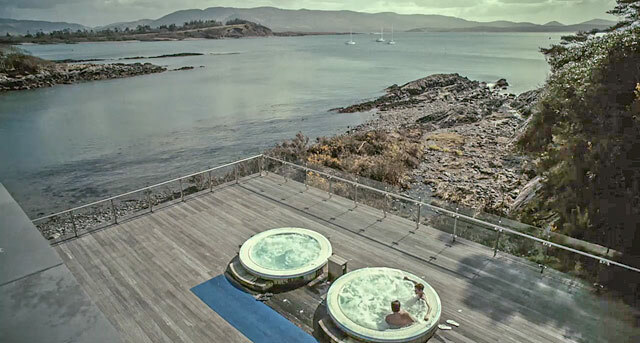 The hotel the film is based in is in Parknasilla near Sneem. The first photo is from the hotel looking over Kenmare River. Keecragh Mountain, a spur from Cummeengeara Horseshoe, sits just over the midground Rossdohan Island to the left, with the sharpish point of Miskish to right skyline near Knockoura. 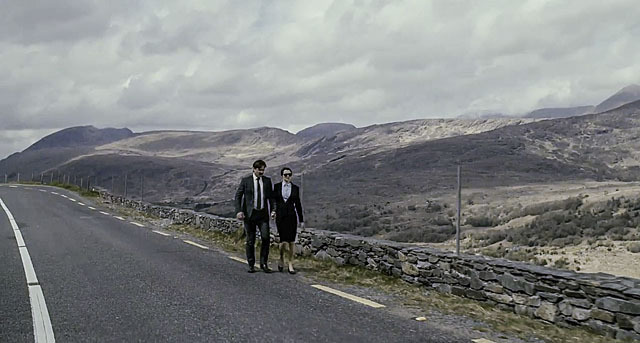 The second photo showing characters played by Colin Farrell and Rachel Weisz escaping along a road just east of Moll's Gap. Stumpa Duloigh is on the skyline left with part of the Knockbreeda-Crossderry-Mothaillín ridge extending to the right. Guest appearances from Broaghnabinnia and the MacGillycuddy Reeks. Film trailer at metacritic.com/movie/the-lobster/. Destined to be a cult. Think about what animal you would like to be. Just a reminder about this item which was covered more fully in previous months and thanks for those that contacted us about it. The Challenge Calendar Notes will resume in the New Year. In the meanwhile you can look at the calendar to see our reports from this year and plan what you would like to do next year. But what does completing a track mean and when should you feel entitled to log your having done it? Before answering that, note that MountainViews certainly doesn't want to encourage anyone to slavishly follow the exact path someone else took. 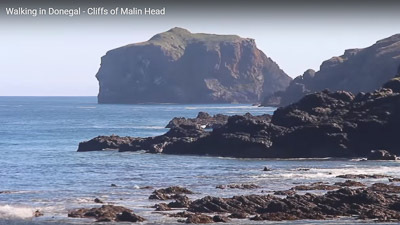 For one thing many of the tracks uploaded to MV are of an experimental nature, done by people visiting an area for the first time. The track isn't necessarily the best possible way on a different occasion - it may even have unnecessary hazards such as bogs, rushes, rhododendrons, crags and land where the owner has not been consulted. It may have taken a route where there are sometimes frisky cattle, nursing lambs or standing crops. We have always stressed that leaders taking a group to a given area should ensure their own routefinding, safety and access permission. Nevertheless we promote sharing of information as a way for people to see what may be possible. Now we also want to share information as to which of the shared tracks are popular, while allowing considerable leeway as to the exact route taken. So "completing a track" has to allow some variation. Our initial offering we will allow you to to mark what you have completed either exactly or approximately. The attached picture shows the approach. The wording may change in the released version. Interested in programming or other development? There's quite a few areas of varying degrees of skill level that would be valuable ranging from Content Management (not programming! ), through html, web, photo, back-end technologies. Mostly we are using open source tech. An interest in innovation in hillwalking would be of great value. MountainViews first book available online and in many bookshops. The first reprint with numerous minor amendments is available. and these shared tracks Benbulbin, Dartry Mountains Ireland, Bricklieve Mountains, Bricklieve/Curlew Ireland, Cnoc na Sleá, Donegal NW Ireland, Coolnahau Hill, South Midlands Ireland, Craig Fach, Snowdonia Britain, Crockauns, Dartry Mountains Ireland, Crockfadda, Donegal NW Ireland, Czech Republic, Pardubický , Drumavohy Hill, Donegal NW Ireland, France, Midi-Pyrénées , France, Midi-Pyrénées , France, Midi-Pyrénées , Garrylaurence Hill, Nagles Mountains Ireland, Garrylaurence Hill, Nagles Mountains Ireland, Gortagarry, Shannon Ireland, Knockadullaun, Knockmealdown Mountains Ireland, Knockakeo, Nagles Mountains Ireland, Knockanora, Shannon Ireland, Lettermore Island, South Connemara Ireland, Lurgacloughan, Donegal NW Ireland, Mount Alto, South Midlands Ireland, Seanadh Bhéara, South Connemara Ireland, Slieve Bloom Ireland, Slieve Foye, Cooley/Gullion Ireland, South Midlands Ireland, Table Mountain West Top, Dublin/Wicklow Ireland, Tonduff East Top, Dublin/Wicklow Ireland, Tryfan, Snowdonia Britain tracks were created. Thanks to all 1215 who have ever contributed summits or routes info and forums. Summary. MountainViews now has 7770 comments about 1417 different hills & mountains out of the total in our current full list (1495). We want to get a good gps track showing each of the major ways up every summit in Ireland. If you see an option to add a "Short Summary" then do please consider creating one since another objective is to have a short summary for every summit in Ireland. There's a few (78) opportunities for you to be the first to comment on a summit. We also have around 1500 shared GPS tracks, mostly in Ireland. Apart from a few popular areas, there is a need for more routes in many different areas. Plain shared tracks without descriptions are welcome however if you have time then do please add route descriptions with photos.